Thanks to the advent of social networking, crowdsourcing is at its best ever. Companies all over the world are able to tap a huge group of people. To complete tasks, problem solve, fund projects, and more. Follow below for a few ways you can employ the crowd. To better a product or service and pave the way. In which companies offer their customers exactly what they want, with their help. Is a process that involves outsourcing tasks to a distributed group of people. This process can occur both online and offline. 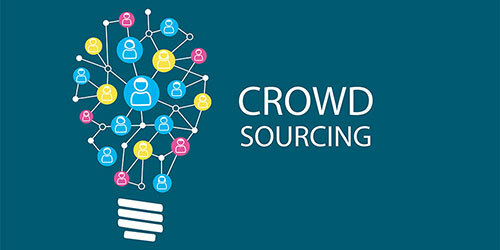 The difference between crowdsourcing and ordinary outsourcing is that a task or problem is outsourced to an undefined public rather than a specific body, such as paid employees. In short, it is harnessing the power of a large group of people to get something done. What better way is to know exactly what the people want. Ask them directly. User voting and collective knowledge is a great way for companies to test new products. It helps them make predictions about the future or future behavior of their customers. Some companies are even harnessing the crowd to gather information about stock and politics. Then use this information and apply the knowledge to predict markets. Companies spend large amounts of time to ensure their product has the stamp of approval before launch. This could even happen before the product is even manufactured. The wisdom of the crowd is an undeniable force for marketing and testing. It will, no doubt, be streamlined and carried into the future. Implicit crowdsourcing is a method to gather large amounts of information without necessarily asking. They collected it and apply it without explicit knowledge. A perfect example of implicit crowdsourcing is reCAPTCHA service. This service allows websites to embed the reCAPTCHA code on their websites. Users solve the CAPTCHAs by transcribing words from books or other important documents. This information is then transcribed and used. Google is possibly the most reliant on implicit crowdsourcing. Using search queries to better spelling correction, understand trends, serve ads, and return more relevant search results. Another great use of crowdsourcing is using a group of people to take on microtasks. Microtasks are a series of commands that would take one person a lot of time to complete. By splitting up the task between multiple people, the tasks now can be done quicker. An example of this could be data entry. You need customer information into your new e-commerce system. If you have thousand customers that need to be entered, this could take a long time. But if you could have a thousand people do just one, then you will be done in no time. Crowdfunding is a relatively new method of crowdsourcing. This allows companies to forgo traditional fundraising and pitch their idea to the crowd. If the project is deemed good, they are allowed to fund varies amounts of money. In exchange for prizes, participation, credit, or early product releases. This way a company can see if a product or service will sell in the open market. There is no telling how much of a value this is to them. Being able to raise funds from a large group is an advantage. This means projects have a much higher likelihood of finding interested investors. There is no telling where the future of crowdsourcing will take us. I imagine a world in which the crowd has more of a say in just about anything. Perhaps issues with every product and service will be worked out to the crowd’s satisfaction. By creating a stronger and more trustworthy economy. Web developers like you will be able to product test on a massive sample. This will not have to second guess a design or usability change.